I’ve been staying up way, way too late lately. First, it was a cookbook deadline. And other writing that…doesn’t write itself. Wouldn’t that be nice? This week, it seems to be hockey keeping me up. Tuesday night my hockey game started at 9:30pm…45 minutes from home. Between the game, commute, wind down, and shower, I wasn’t crawling into bed until way too close to 1am. On a school work night! I’m beginning to feel like I did in college – surviving on caffeine and a to-do list that never ends. One thing gets crossed off the list and another 6 get added. Then last night, there was also hockey interfering with sleep. Though we live half way between Detroit and Chicago, more-or-less, we didn’t get any of those games on our dish channels. Now that it’s the Stanley Cup Finals, I had to watch the Chicago vs. Boston game 1. Let’s just say, being on EST is not helpful for late sporting events. But it was well worth it when Chicago tied it up with 9ish minutes left in the 3rd….and then the game went into overtime. By 11:20pm, the game was still tied at 3. I had to say, “Mercy,” shower, and collapse into bed. 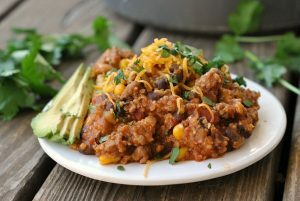 Needless to say, by the time I stumble in the door at night, workouts have been…difficult, and dinners have had to be extremely simple, quick, healthy, and good. There’s nothing like being whipped, making dinner, and it’s not even good. In fact, that’s the absolute worst. This recipe, however? It has most of my favorite ingredients. 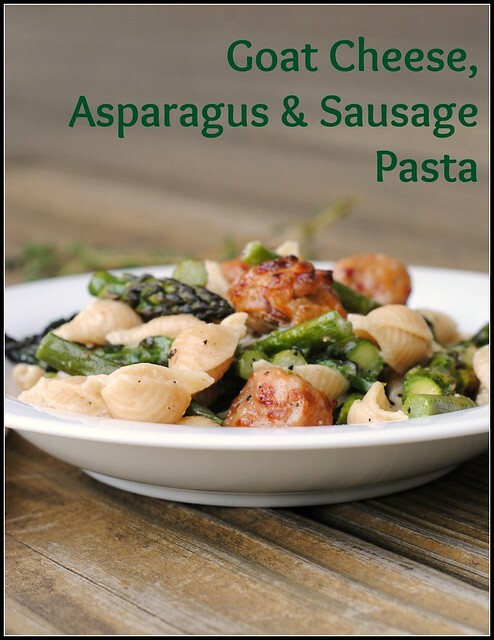 Goat cheese, asparagus, and spicy chicken or turkey sausage – I’m smitten with each and every one of those ingredients. If you are, too, you’re welcome! Preheat oven to 450 degrees F. Line 2 baking sheets with parchment or foil and set aside. Toss asparagus with olive oil and place on the baking sheet, leaving half of one of the sheets open. Top asparagus with salt and pepper. Slice sausage into 1-inch rounds and add to the empty half of the baking sheet. 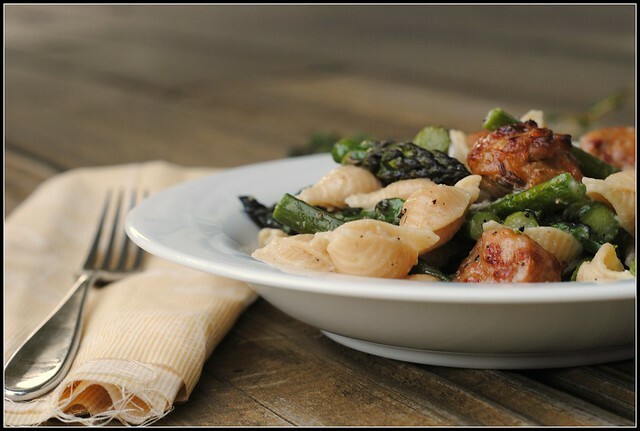 Roast until asparagus is tender and sausage is cooked through, about 15-20 minutes. Meanwhile, bring a large pot of water to a boil; cook the pasta until al dente, about 10-13 minutes. Reserve 1 1/2 cups of the cooking water; drain the pasta. Whisk together the softened goat cheese, butter pieces, Parmesan cheese, and 1/2 cup of the pasta water. Season with garlic powder; whisk until smooth. 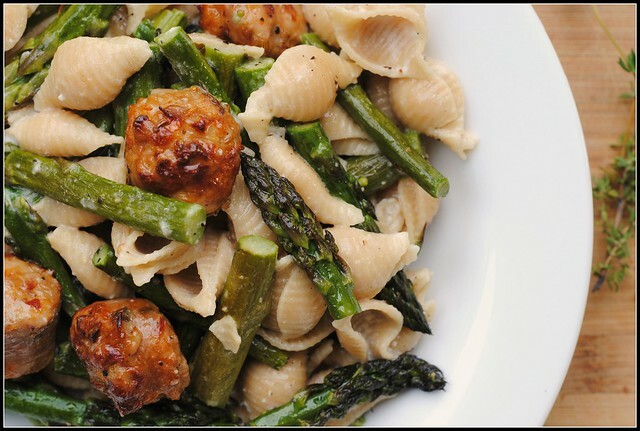 Return the pasta to the pot, and toss with the goat cheese mixture, asparagus, and chicken sausage. Add pasta water a few tablespoons at a time until a thin sauce coats the pasta. Result: The tangy goat cheese goes a long way in this dish. 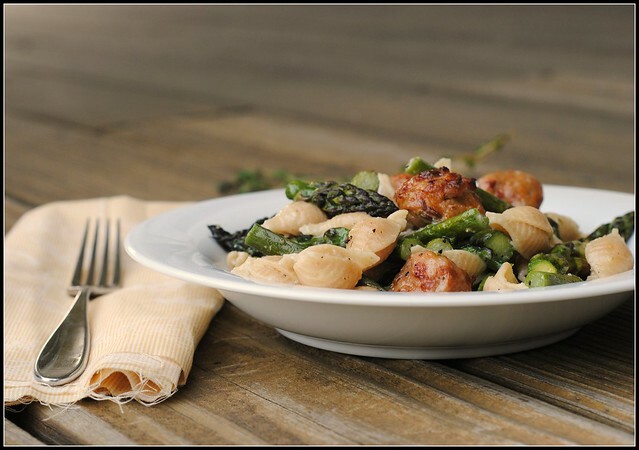 The spicy sausage and hearty asparagus with the whole wheat pasta make for the perfect balance between healthy and indulgent. This meal comes together in about 25-30 minutes and makes a lot! Enjoy! This week has been a doozie…bring on Friday! This looks delicious! I’m ready for Friday too! 1. I am definitely making this next week! I try to do only one pasta dish a week, its hard because I love pasta so much! 2. I stayed up for the whole game and I am SO tired! 🙁 Are you rooting for the Blackhawks as a Detriot fan? In Boston one of our morning sports radio show host is from Detriot, he hates on the Blackhawks so much, its pretty funny…. I love anything with goat cheese – so putting this on the list to make – stat! I went to bed after the first overtime and was fast asleep by 10:45 – my sister stayed up until the end and didn’t get to bed until 1:00! I always forget that Michigan is Eastern time too! 😀 Here’s to a speedy two days until the weekend! Goat cheese is my FAVORITE! I usually don’t eat it until I’ve eaten everything else on my plate, just because I like to save the best for last. And that was a crazy hockey game!! We couldn’t believe how many OTs there were. But if that was Game 1, it’s going to be an amazing Stanley Cup series! Really?? That’s not fair! I think you need to call up Dish Network and explain to them the gravity of the situation. It’s the Stanley Cup Finals!!! Hey busy bee, you need to slow down. I hear you though. Could you imagine if you had kids? I don’t even want to think about it….. 🙂 This dish looks awesome. I bet it smelled really good too while cooking that sausage 🙂 Take a brake and sleep girl. Maybe over the wknd…. I know, right!!! Miss you, lady! These are some of my favorite flavors, too!! I am excited to try this. Did you use pre-cooked sausages? 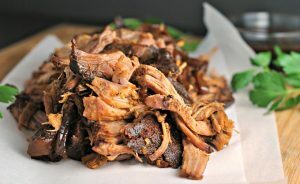 This looks AMAZING — three of my favorite ingredients! Love that it’s ready in about half an hour, too. Perfect for a busy weeknight. I made this last night but realized I didn’t have asparagus and just waited until the end and subbed chopped fresh spinach. My 5 year old ate everything! Thanks! This includes my favorite ingredients too! I could sure use this on those busy weeknights. This looks like a perfect weeknight meal. Fantastic pictures too!